Linearted the hair was horrible for me :D Rest of the Asriel was easy but the hair ouch! Coloring was the fun part i do little more better with the gradients so i colored all the hair with it and some the clothing. 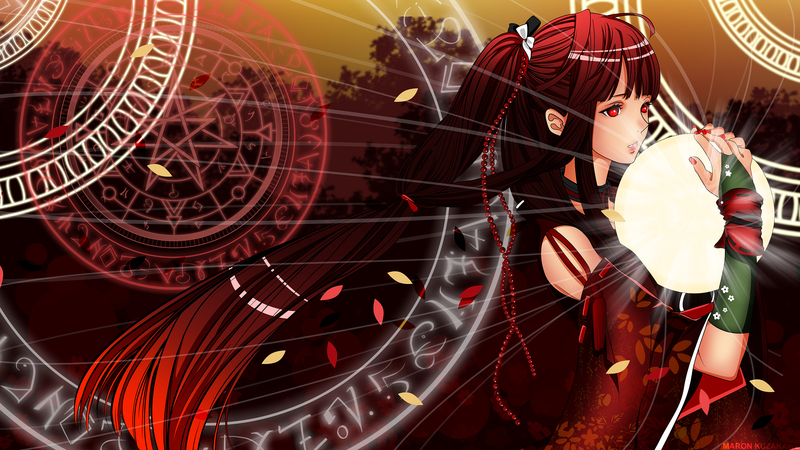 Pettals on the kimono, wodds in the back and the two magical circles are from deviant art, free dowloaded as vector brush. The flowers, petals and the left corner circle is my own work. I do them with ilustator and with photoshop i only multiplyed and resized them. The most back bg is basic brush and mixing colors. Browse Asriel Gallery: Recent | Popular. just one teeny detail missed...the tree in the background got abruptly clipped :P everything else is perfect! I second the tree in the background being abruptly cut off. Also, the trees in the background are pretty low quality - very pixelated and blurry. Other than that, you're showing improvement from your previous work. Nice job on the vector and those magic circles in the background fit.